Yesterday was the two-year anniversary of the creation of this blog! Click here if you want to see the (very) humble beginnings. Since those early days I’ve become a better writer and photographer. I’ve also become a master trash-picker. I don’t have any plans to quit any-time soon and definitely look forward to doing this all through the summer, I think it’ll be a good one. 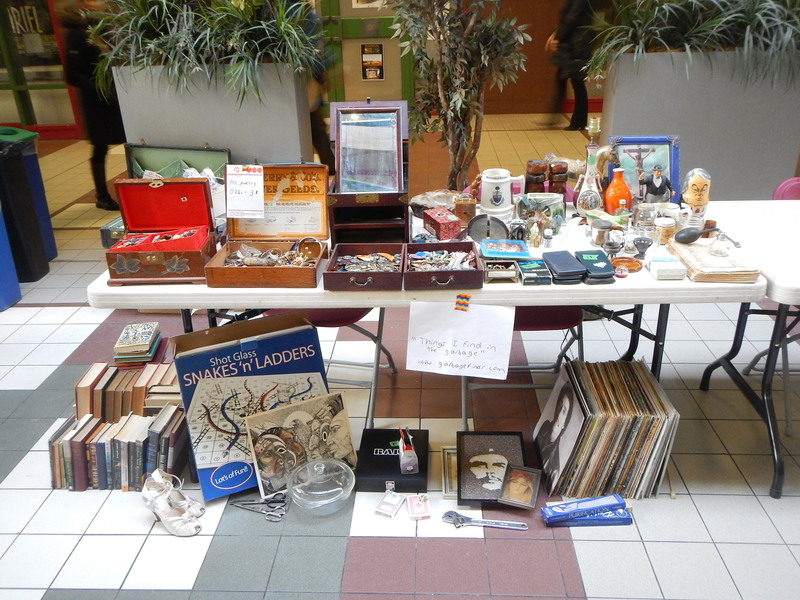 I was a vendor at a sustainability fair at Concordia yesterday as well, selling my wares and talking to people about salvaging. It’s nice to see my things sparking people’s curiosity. I particularly like it when an object finds a good home. I made over 250$ in total. Considering these profits and a temp job I’ll be working at the end of April I should be financial secure for a while. I also ended up finding some really good trash by chance. I had planned on taking the morning off – the event started at 11 and it was best if I got in around 10 to set up. That didn’t leave a ton of time for trash hunting. I decided that it was best to rest more and go to the event at the top of my game. However, life got in the way. I woke up at 3:30AM, five hours before my 8:30 alarm. I knew that I wasn’t going to get back to sleep because I was stressing about the sale. I had to find a way to kill some time, and hunting through trash seemed like as good as choice as any. 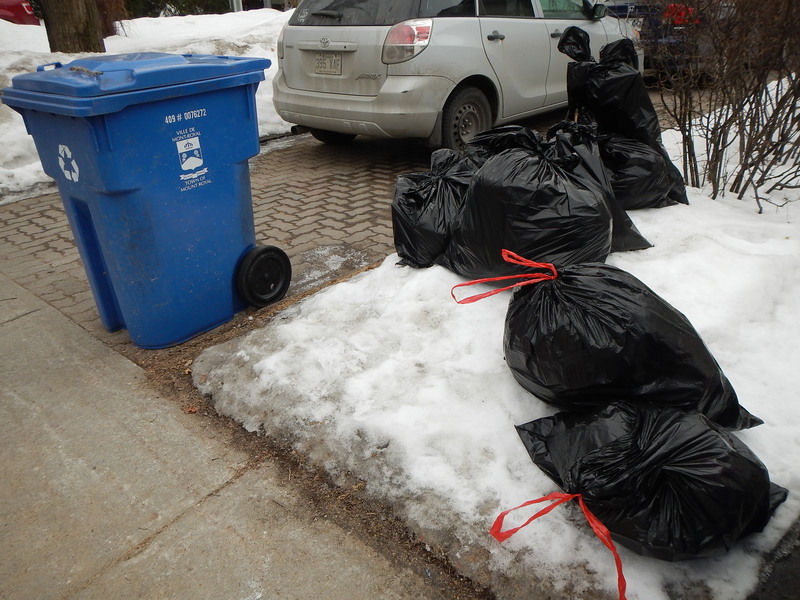 I made my way towards the Tuesday morning pick-up in Hampstead and NDG. Hampstead produced nothing. 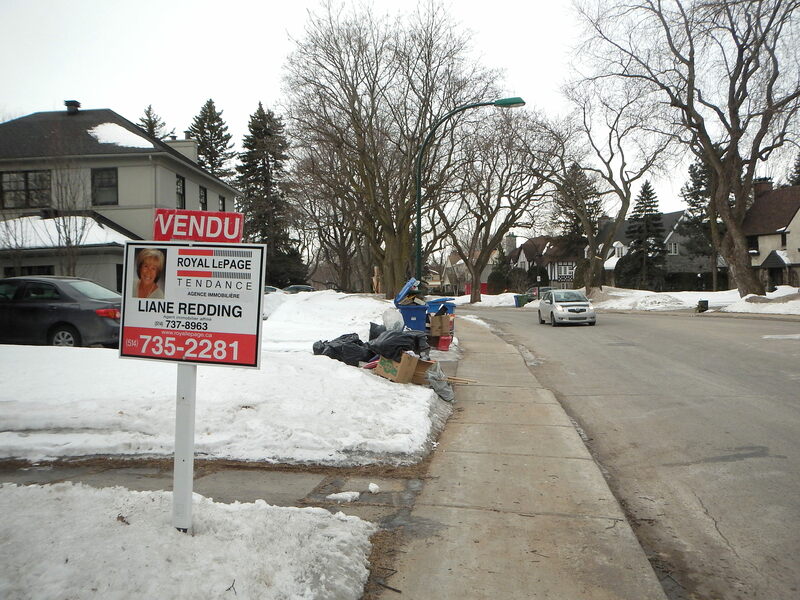 NDG was bare as well until I approached this collection of things near Monkland. 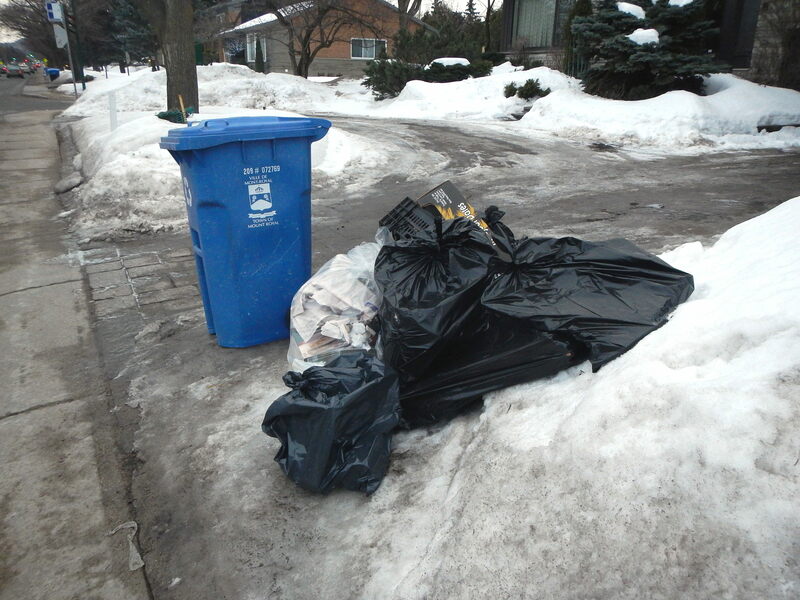 Not long after I arrived I heard the garbage truck coming up the road. By then, knowing there were good things to be taken, I stashed most of it in and next to the car until the truck passed, leaving the carpet behind to be sacrificed. 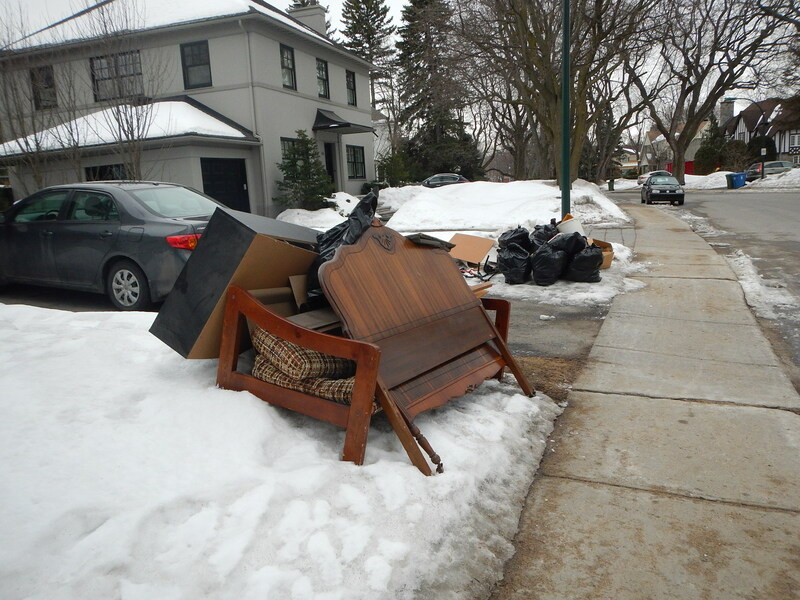 In this part of NDG they clear the trash one side of the street at a time, meaning that I was conveniently able to leave what I didn’t want on the other side of the street. I took both suitcases. They need a good cleaning but I think they’ll be fine. 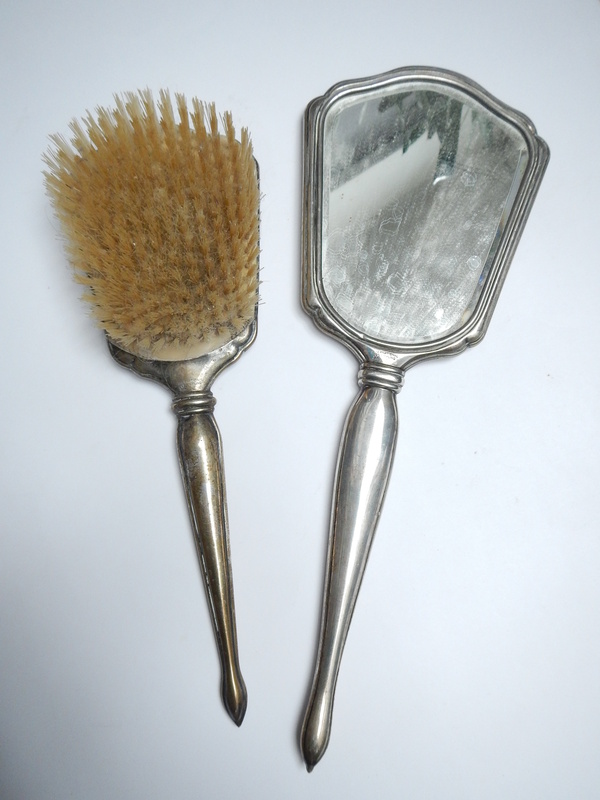 The mirror and brush are both marked International Sterling. These are true antiques worth easily around 50$ a piece. Both need cleaning but that won’t take long at all. 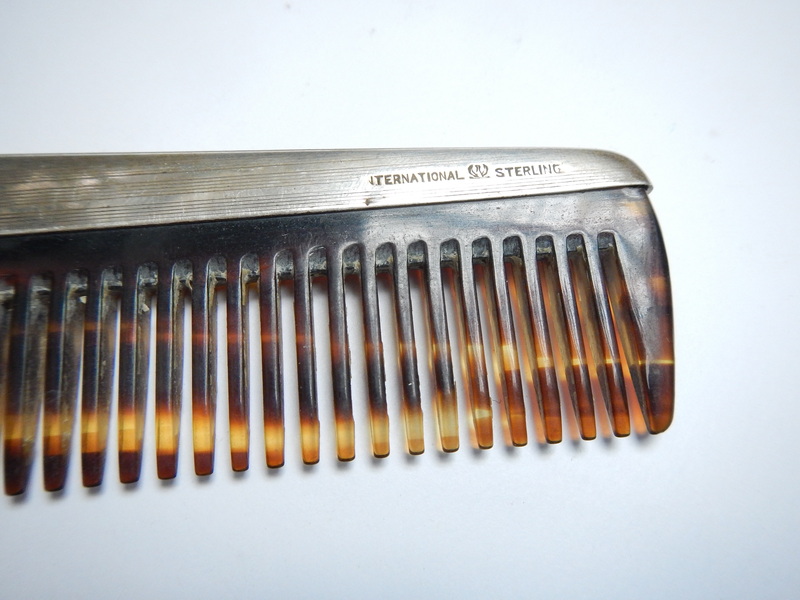 This comb is also marked International Sterling. The teeth are made of faux tortoiseshell. It’s worth another 30-40$. 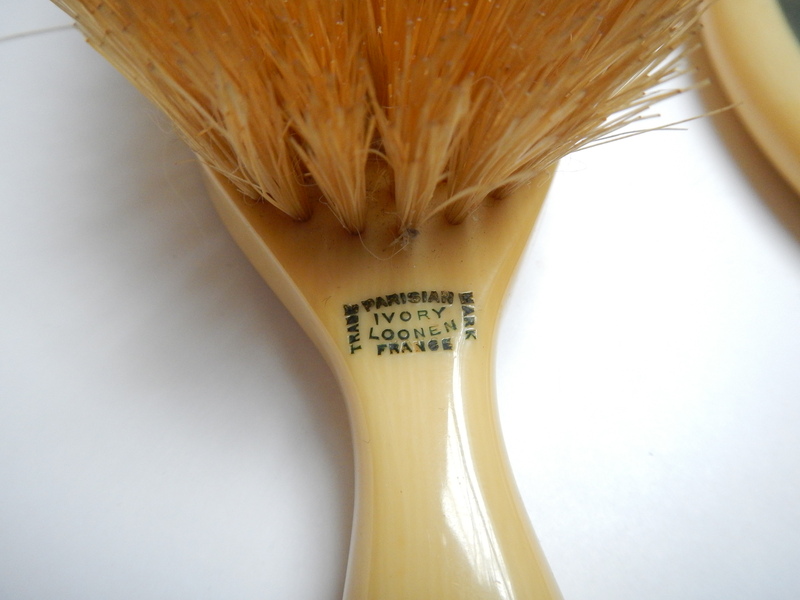 With the mark “Parisien Ivory Loonen France” printed on the handles, I originally assumed these two pieces were made of ivory. 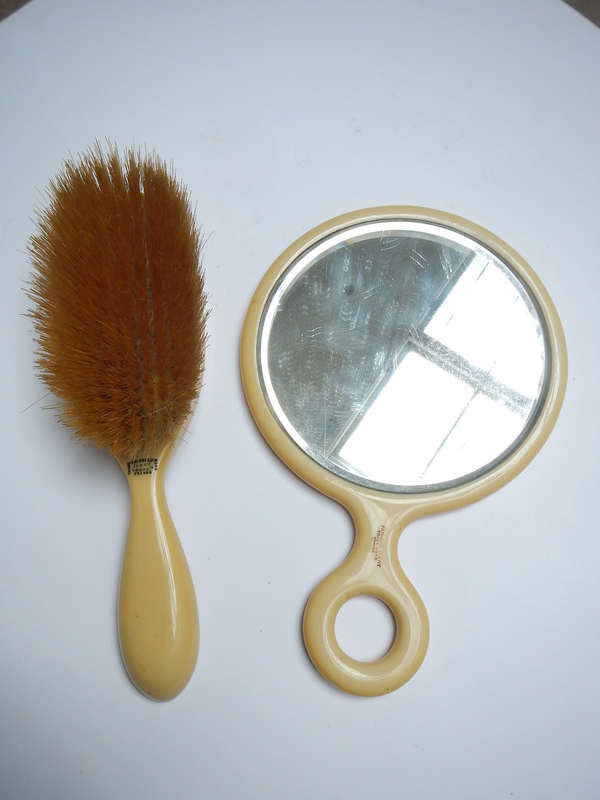 However, they are both made of celluloid, a vintage plastic from back in the day that mimicked it well. Even though it’s an unethical material (for mass cosmetic consumption anyway), I was a little disappointed mostly because I have yet to see a true ivory piece. Regardless, these are somewhat collectible. The set would probably sell for 40-50$. 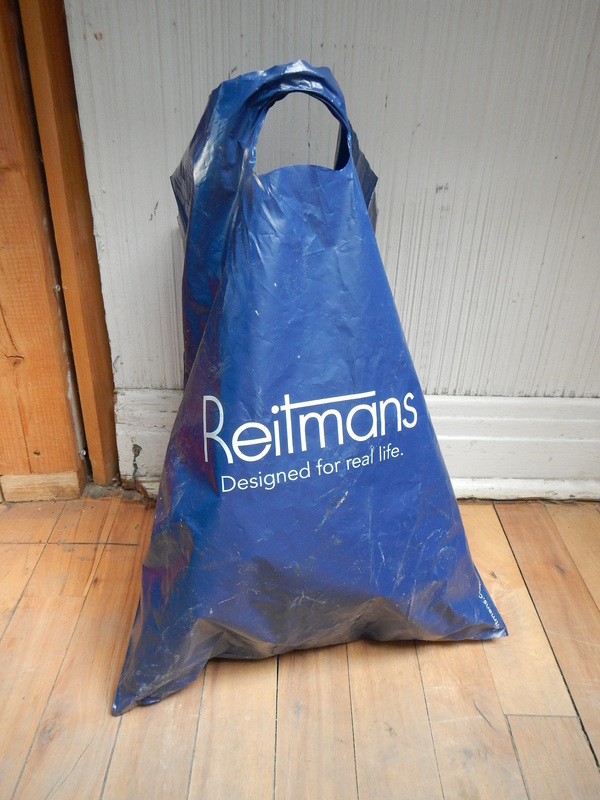 There was more silverware inside this Reitman’s bag. 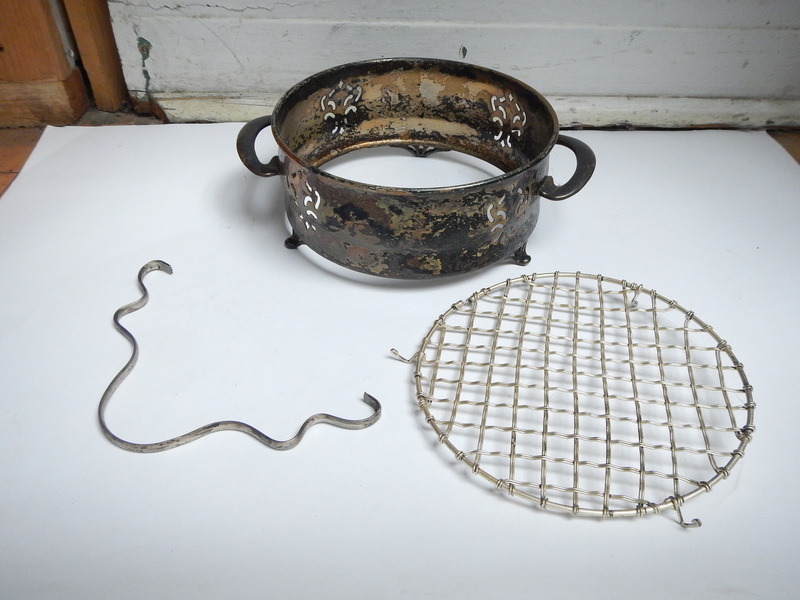 I can’t find marks on a couple of these pieces but they are surely old silverplate. They’re all heavily tarnished but in great condition. 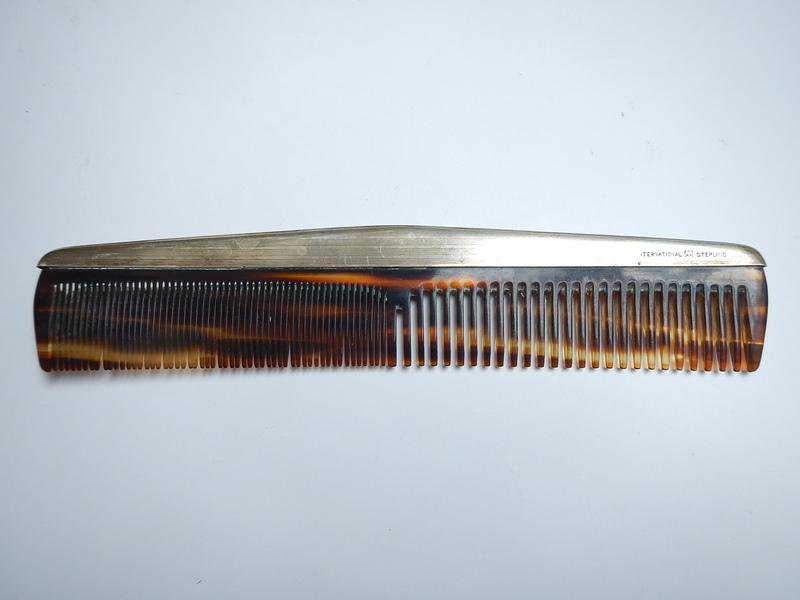 This one’s marked Rideau Plate. There are a few things etched on the bottom but I can’t make them out. 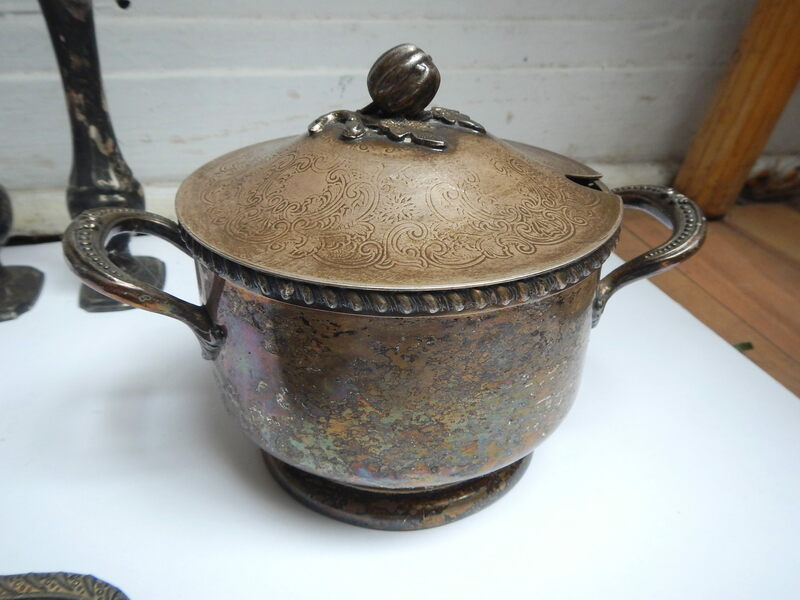 I couldn’t find any similar bowls on Ebay, but a similarly ornate tray created a bidding war and eventually sold for 180$. 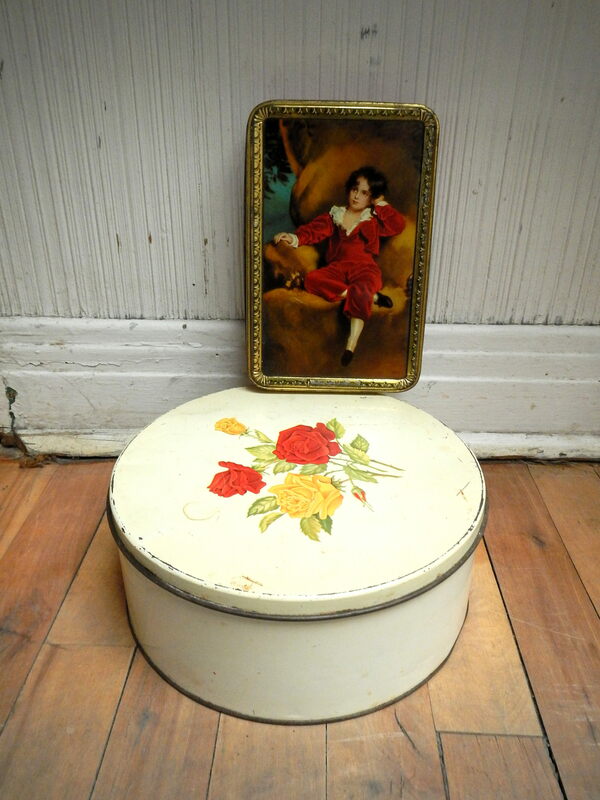 This little covered tray is was made by WMA Rogers. I’m not sure what its specific function is. 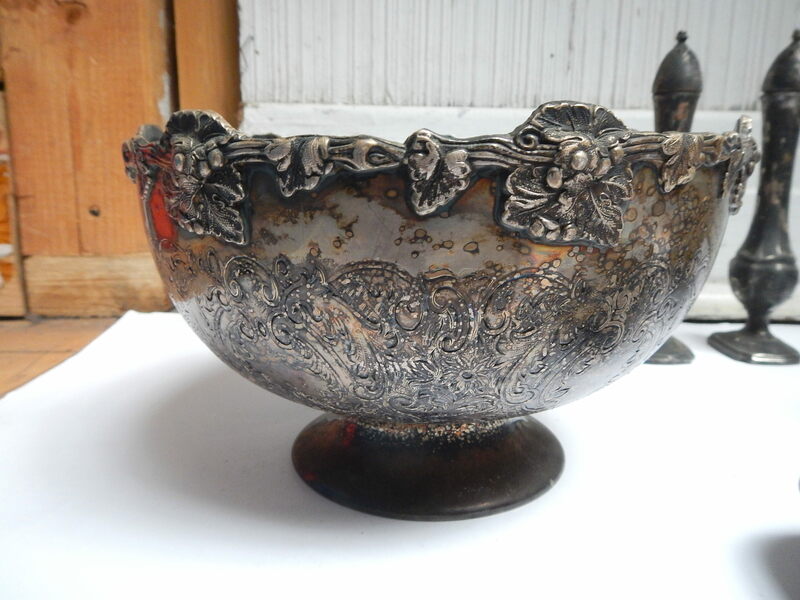 I couldn’t find a mark on this one, though the design looks a bit similar to the Rideau Plate bowl. I also don’t know what this is for, my guess would be sugar as there’s a hole to put a spoon in on the side. The salt shakers are marked BP for Benedict Proctor. They’re silver plated lead which to be honest I’m not sure I’d want to put food in, though it’s unlikely that the plate inside the shakers would ever be damaged. There’s a pair on Ebay going for 29$. Some odds and ends from the bottom of the bag. 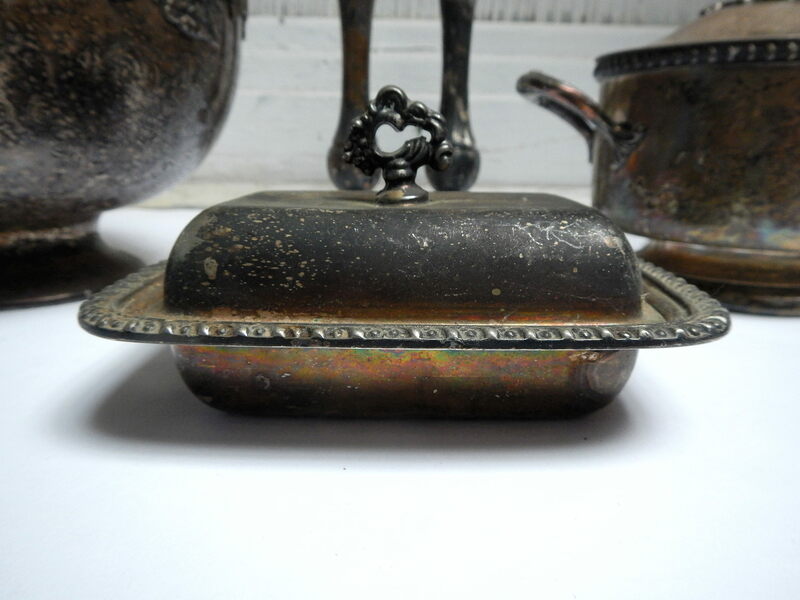 I’m not sure where (or if) the handle fits into things but it also appears to be silver plate. I’m guessing the piece in the back is missing something, though for all I know maybe it’s supposed to be like that. In addition to the silver I also found a few tools. 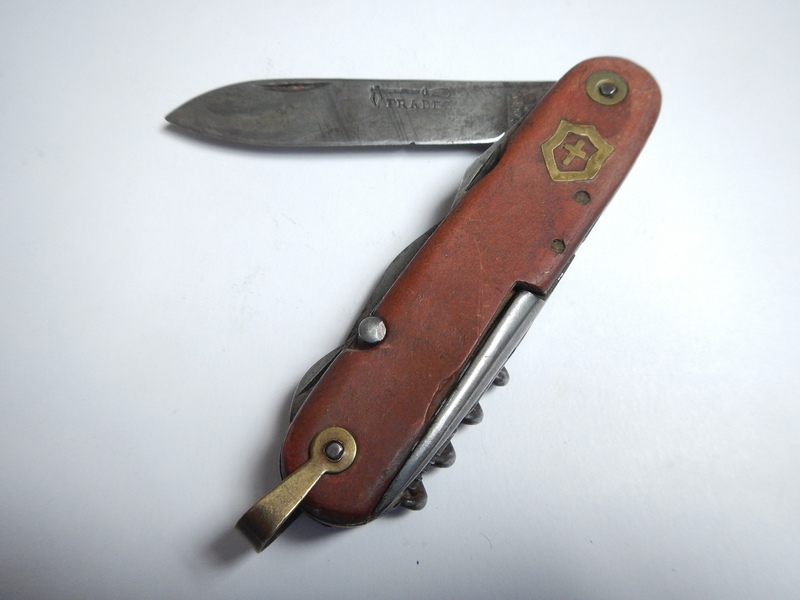 I really like the old Pradel pocket knife. I think I’ll keep it, these things are handy! 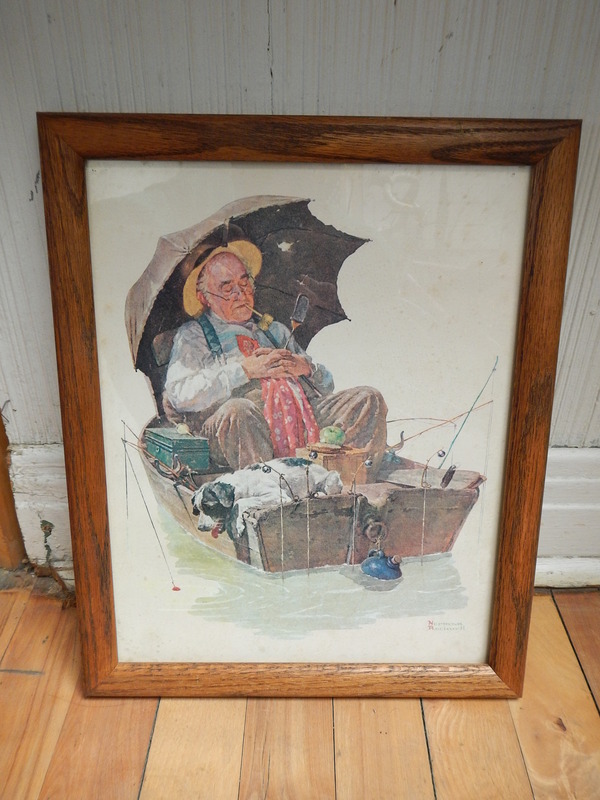 Last but not least is this old Norman Rockwell print. I had heard of him but I was never familiar with his work. I like this image a lot, it’s simultaneously realistic, idealistic and somehow relaxing. 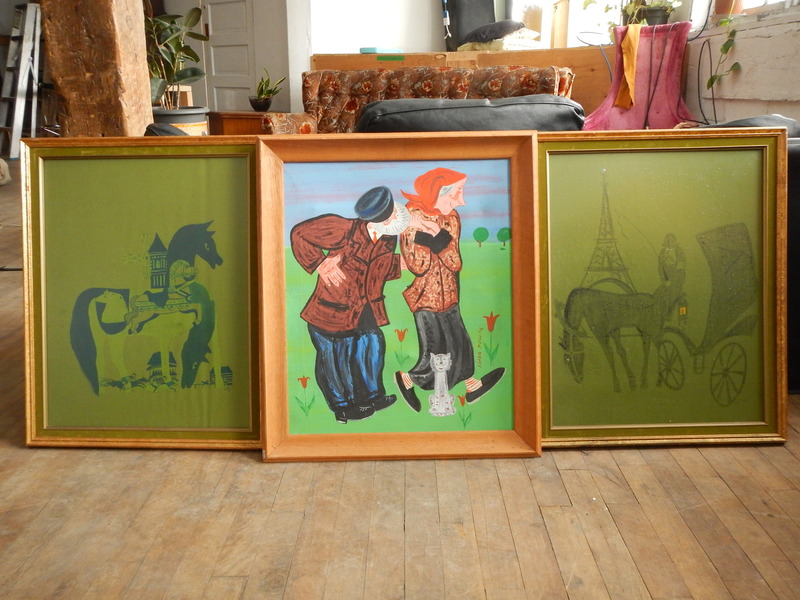 I don’t think it’s worth much, though being nicely framed I could get 20$ – if I want to sell it, that is. All these items were about one minute away from being destroyed, making the experience extra satisfying. Today’s trip to TMR was surprisingly unproductive. I found a few neat things at one place, but I think I’ll save those for another post. I haven’t decided what I’ll do tomorrow. I’m thinking of going to Westmount for the first time in about six years, though the end of the month at Rosemont can also be a good run. I’ll keep you posted regardless. If you are interested in buying any of the items you see on my blog I would love to hear from you! Email me at thingsifindinthegarbage@gmail.com and I’ll get back to you within a few days. Today’s trip to TMR was a bit more social than usual: two people went out of their way to offer me things to take home and one told me I didn’t have the “right” (tu n’as pas le droit!) to look through the trash. It was fine though, his bin contained nothing even vaguely interesting anyway. There were plenty of decent things on the curb today. 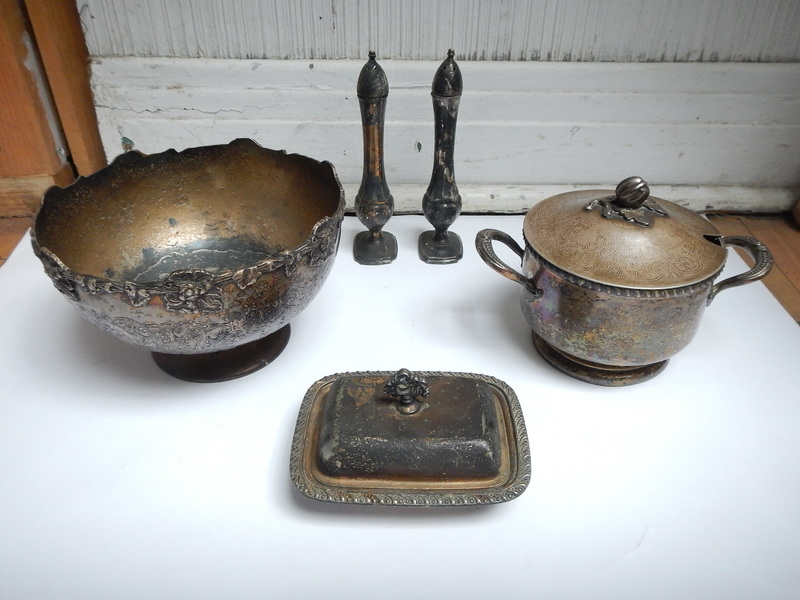 I ended up leaving a lot at the Give Box on St Viateur, including some nice dishes and knick-knacks. Nothing I took home was particularly mind-blowing but there were still some solid finds. Recently I’ve been trying to snap shots of the trash before I start fully rummaging through it. 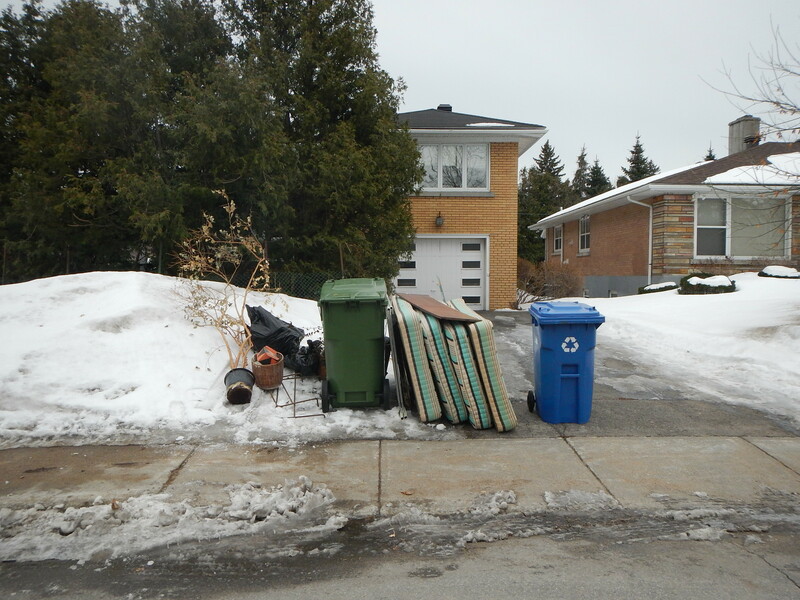 I feel adding the pictures of the curbed trash to the blog adds context and helps to illustrate how unexceptional these piles often look from the outside. 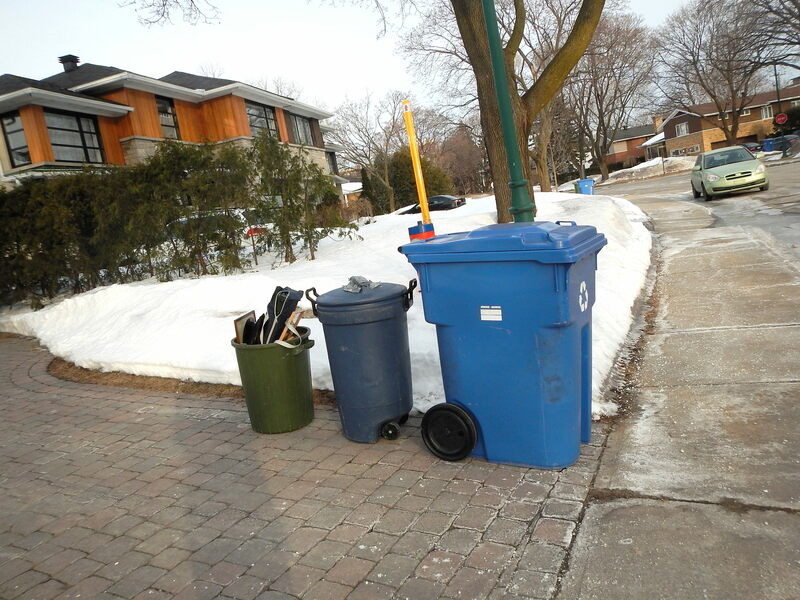 I prefer to include a picture where the garbage is unperturbed and truly “as it was”. However, I’m not sure it will always make sense to do this. Some trash looks interesting and then isn’t, making the photo-taking process useless. Taking a photo is also something that people find a bit sketchy and if someone happens to be watching they might feel the need to confront me or to call the authorities. Regardless, I’ll do this as long as I feel comfortable doing so going forward. (To clarify, this comment is totally unrelated to the story of the man above who told me I didn’t have the “right.” I hadn’t taken a photo of his offerings. Anyway, let’s get to the garbage. These bins were in front of the same place where I found a bunch of old framed photos a few weeks back. They’ve been slowly clearing house and throwing a bit of stuff away each week, though it’s not always particularly exciting. 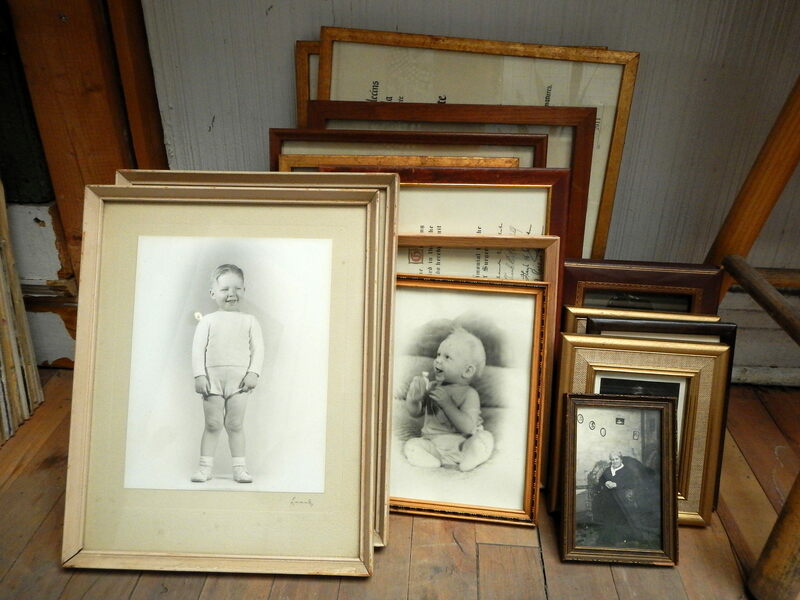 And this week… more framed photos! There’s some nice old family photos but nothing quite as interesting as last time around. The frames are all great, however. I’ll give some to a friend to mine to put her artwork in. 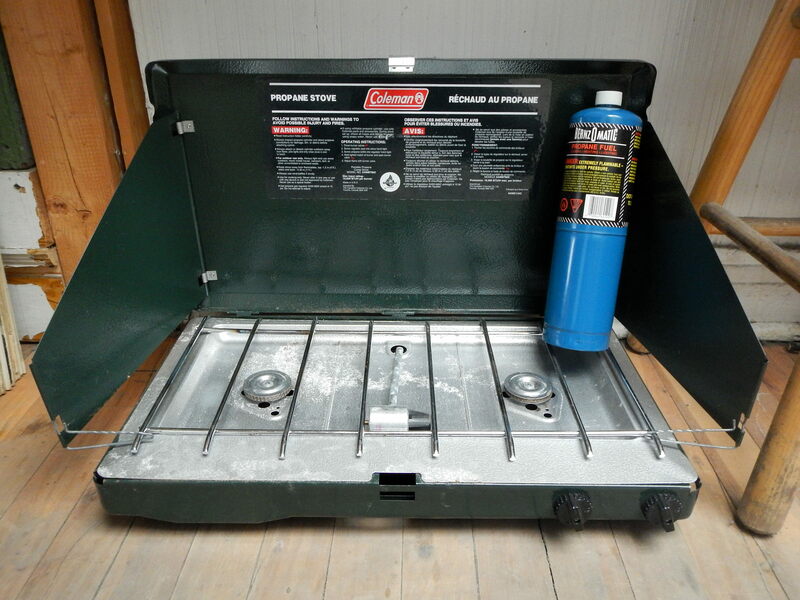 Inside the blue bag in the left bin was this Coleman-brand propane camping stove. It even comes with a half-full propane canister, which I wouldn’t think is a good thing to throw in the compacter. It looks to be in pretty good condition. Most of my take-homes came from this spot, the same one where I found the stamp collection two weeks ago. After looking through some of the trash bags a woman came outside and began offering me things. She ended up giving me a metal shovel, a little table and a big (again half-full) canister of propane propane (this is a reference to one of Leahy’s crazier moments on Trailer Park Boys if anyone’s wondering). She told me she was helping her mom clear house before a move. She said she was going to bring things to Renaissance (a local thrift store) but there were definitely donate-able items inside the bags. Maybe there’s so much inside that it’s kind of overwhelming to sort through. 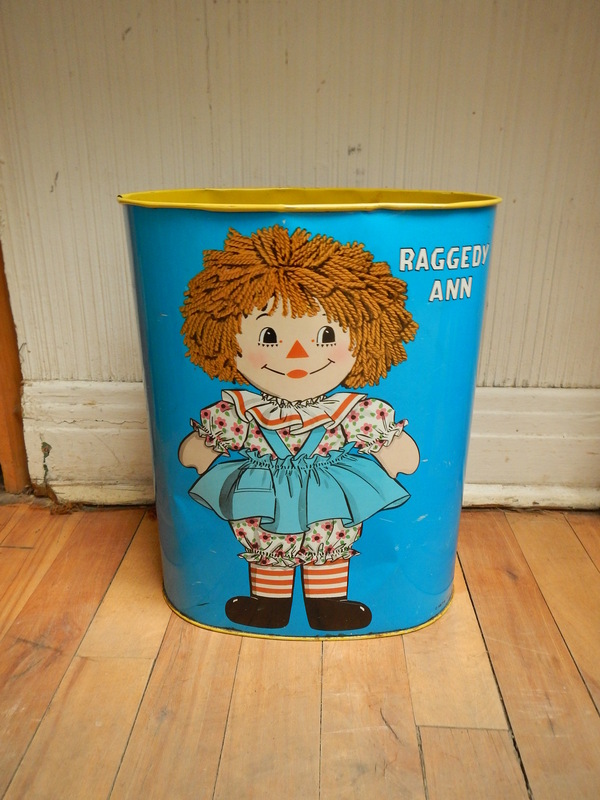 This vintage 1972 Raggedy Ann / Andy refuse bin is pretty cute and somewhat collectible. I have a friend I think might like it. I really like the classic design of this mug made to commemorate Canada’s centennial. 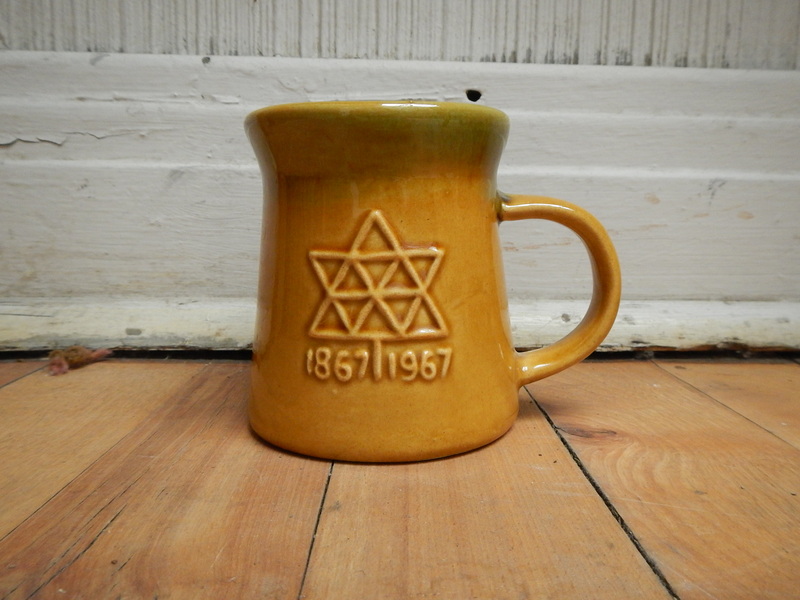 By the looks of it I’d guess it was made by Beauce, a company in the south of Quebec that produced a fair bit of ceramics back in the day. Inside the black bags was a worldly collection of knick-knacks and souvenirs. The figures on the left, which have bells underneath by the way, are souvenirs of New Orleans. The container in the middle was made in the USSR. 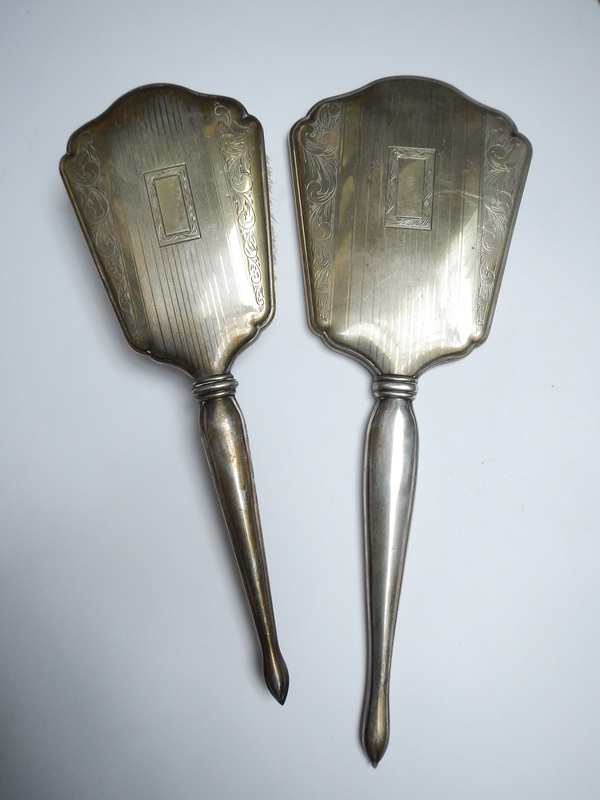 The brass plate in the background was made by Peerage in England and is somewhat collectible. 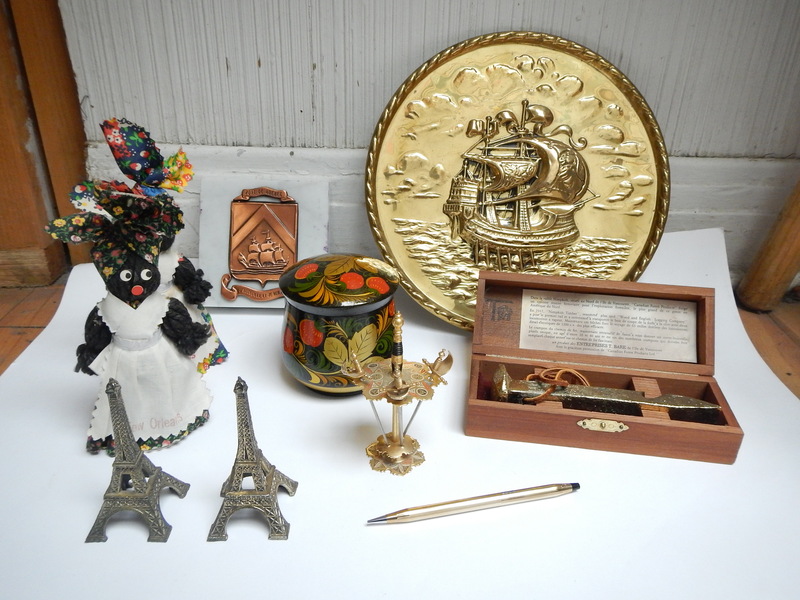 We also have a couple Eiffel Towers (from France I’d presume), miniature swords from Toledo, and souvenirs from the port of Quebec and some railway in B.C. On the bottom is a 10k gold-filled retractable pencil made for IBM. It’s actually pretty sweet and a similar one on Ebay sold for 21$. 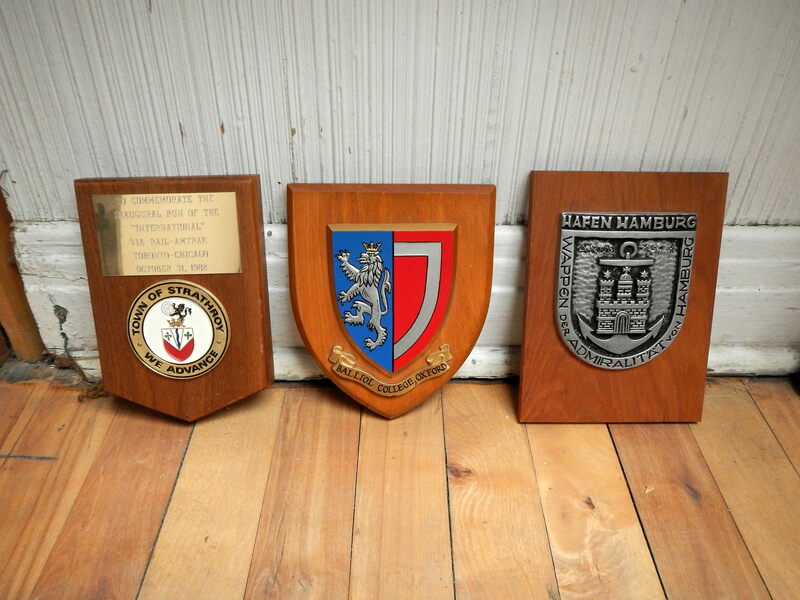 There were a few wooden plaques, one for something (?) in Germany, one commemorating the first Canada-US run by Via Rail (in 1982 if anyone’s wondering), and one for a Balliol College in Oxford (England). 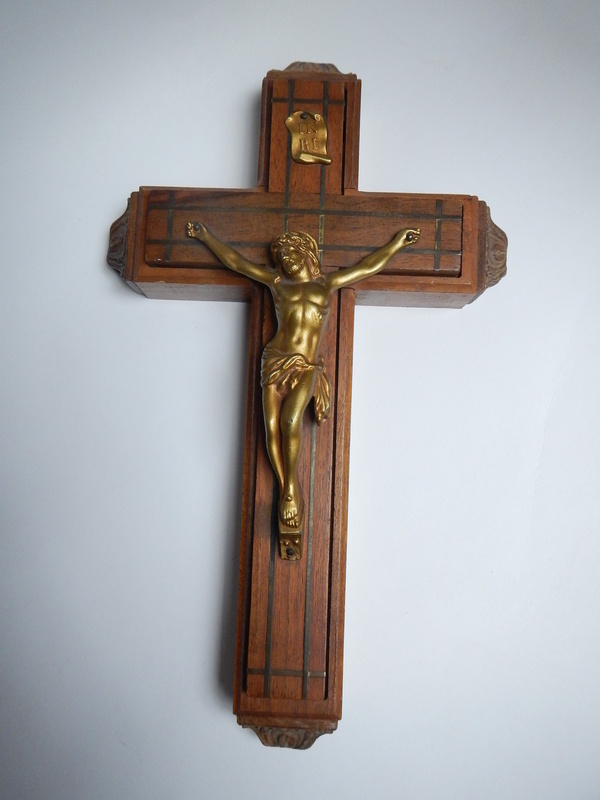 This beautiful wooden crucifix possesses a secret compartment hidden behind the Christ. I can’t figure out how to open it, though from what I can see there’s just a couple candles in there anyway. 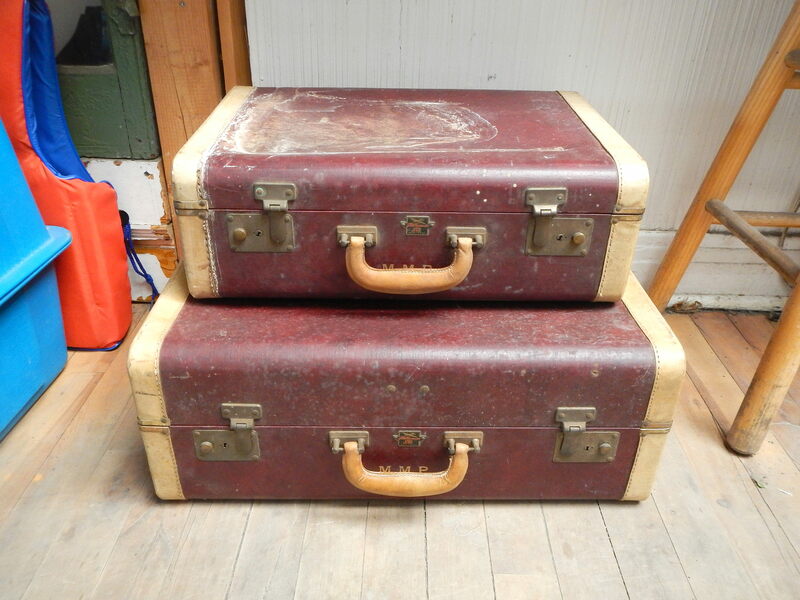 Two vintage tins. 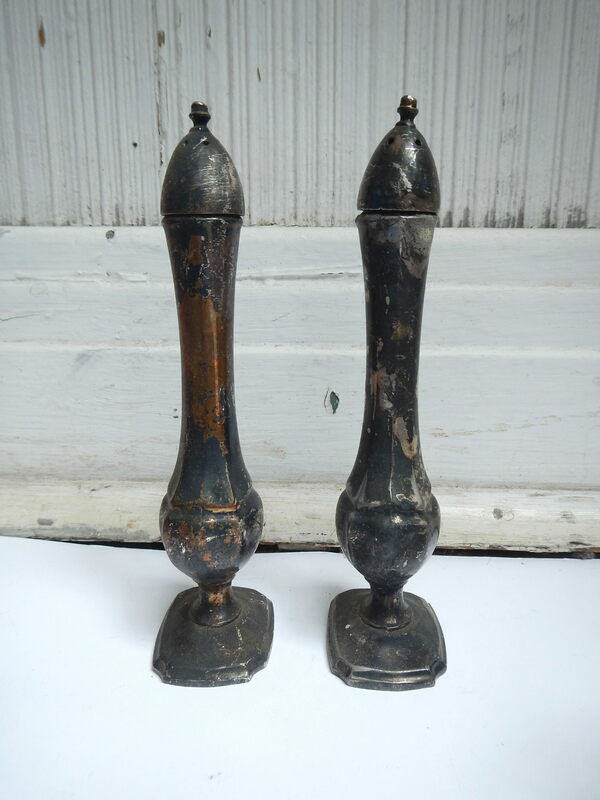 These are great for storing away junk you find in the trash! This program from a 1973 recital at the NAC in Ottawa wraps up the items from that spot (for this week at least!). The show featured Joan Sutherland, a famous opera singer who died in 2010 at the age of 83. 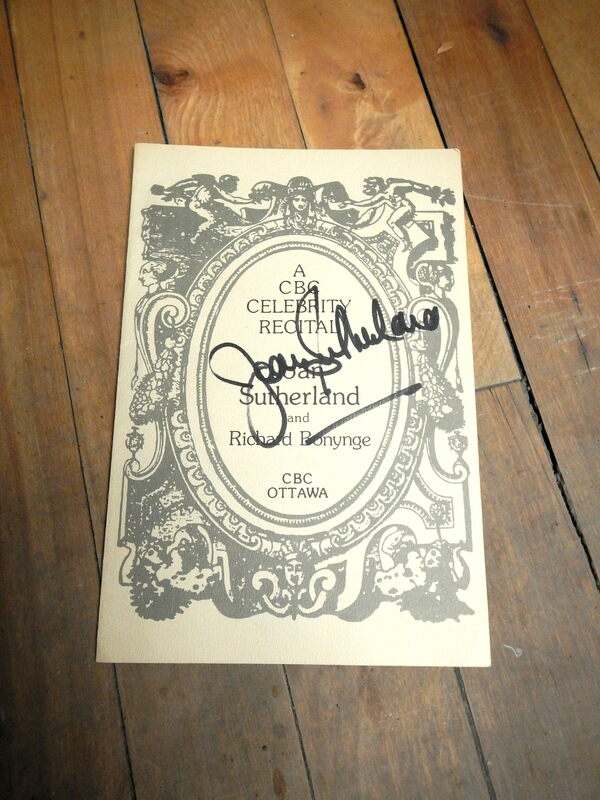 What’s interesting about the program is that it appears to be signed by Sutherland herself – a comparison with ones I see on Ebay checks out. I doubt it’s worth any more than 10$ but it’s still cool to find. I had never heard of her before, here’s a sample of her singing if you’re interested. Now for a few things from last week. 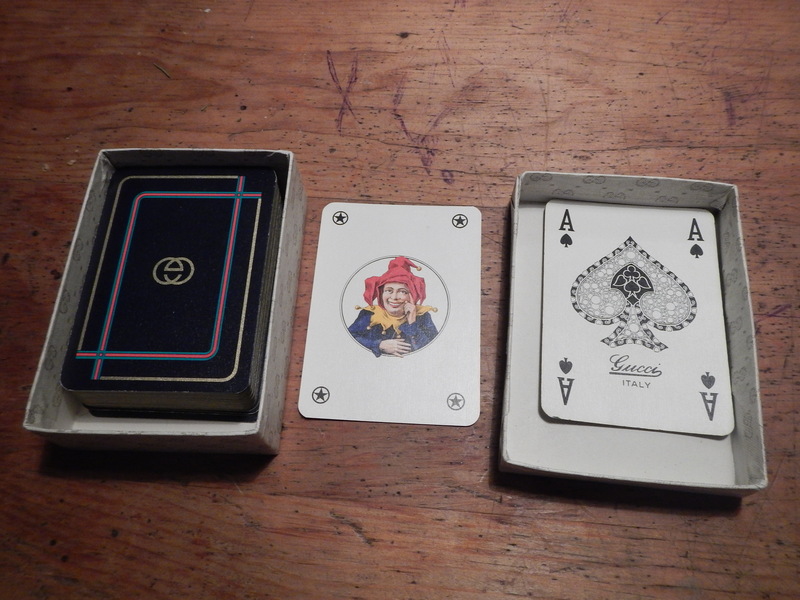 I found this vintage pack of cards in TMR last Wednesday and only today (upon cleaning out the car) did I notice that they were made by Gucci. A pair of decks like this recently sold on Ebay for 100$, believe it or not, and while mine aren’t in quite as good shape they should still garner 20-30$. 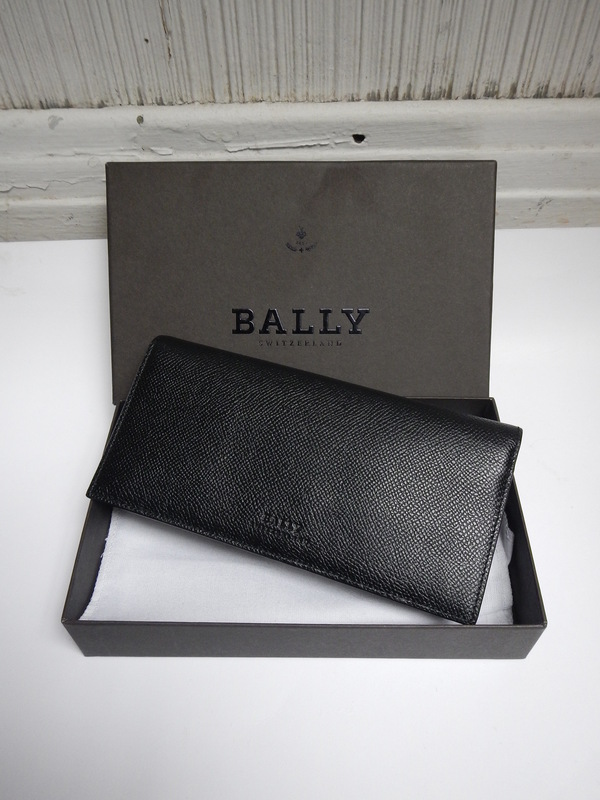 My Friday trip to Rosemont also provided a few good finds, including this brand-new-in-box Bally continental wallet. It came from the same house as where I found the stereo set-up the week prior. These people are apparently ballers – they also threw out three good watches and a couple pieces of silver jewellery. This is an excellent quality wallet that I have reasonably (based on my research) put on Ebay for 150$. I came across a collection of black bags in front of a triplex somewhere on 7th Av. Inside the bags was a lot of Christian miscellanea (crucifixes and a 3d picture of Jesus, for example) and jars upon jars of old screws, nails and etc. Whoever owned this stuff was clearly older as no one holds onto things like that these days. 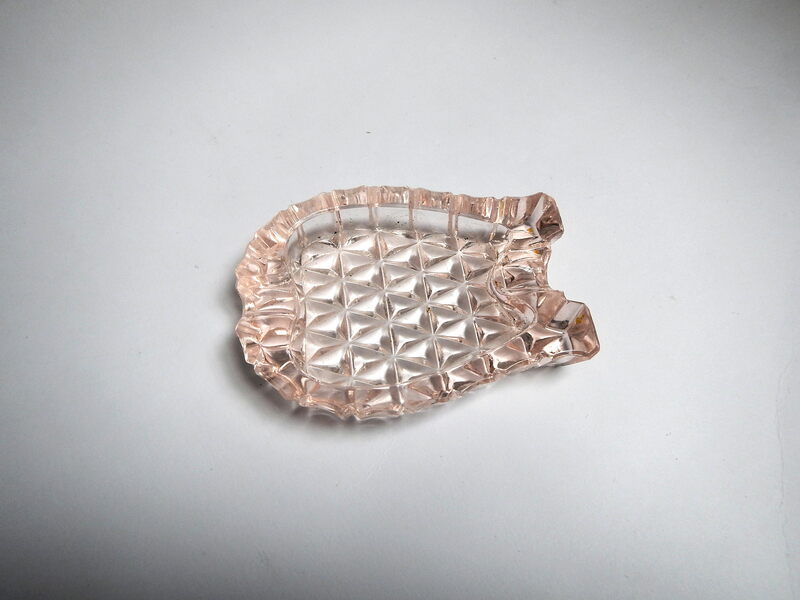 My best find was this cute depression-glass ashtray. I’ll check back this Friday to see if I find anything else. In other news a battery and a battery charger I ordered off Ebay came in. The charger was for a Sony digital camera I found back in December and the battery for a Video 8 Camcorder I procured just a few weeks ago. The new batteries confirm that these pieces work as I expected them to. The camera should sell for around 30-35$ (charger cost: 12$) while the camcorder should sell for around 80 (battery cost: 10$). I’m still expecting a charger for the other camera from that post in December. I also made a couple of sales. A 10k gold ball necklace sold on Etsy for 96$ and a 1913 silver coin from Germany (which I found with the WWI dog tags a while back) sold for 39$. Tomorrow morning will be pretty messy, both rain and snow are in the forecast. I plan on making it out regardless, however. If I’m feeling adventurous I’ll go to Westmount for the first time, if not I’ll go to Rosemont. A big storm rolled through town yesterday bringing 20cm of snow, gusting winds and bitter cold. Fortunately for me the storm arrived after my trip to the Town of Mount Royal. It was an interesting day, featuring a few things I had never seen before and a person asking me to not look through his trash. 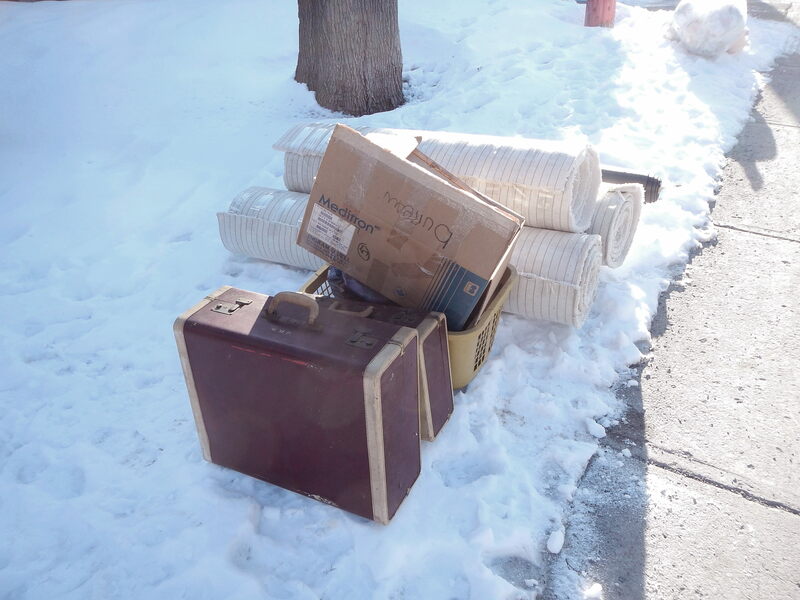 This garbage belonged to a dentist that has been tossing occasionally cool items for a couple months now. I’ve come to expect to find something here every week, though it’s not always super exciting. These people seem to have collected and spent a lot of money on art. I found three more pieces by Ludo Pollack, two of which are marked 1972. I now have 7 pieces of his art. These ones I hung up in the hallway entering my place, they spruce up the white walls that are in need of a new paint job. This machine, a Sklar Rotary Compressor, was inside one of the bags. 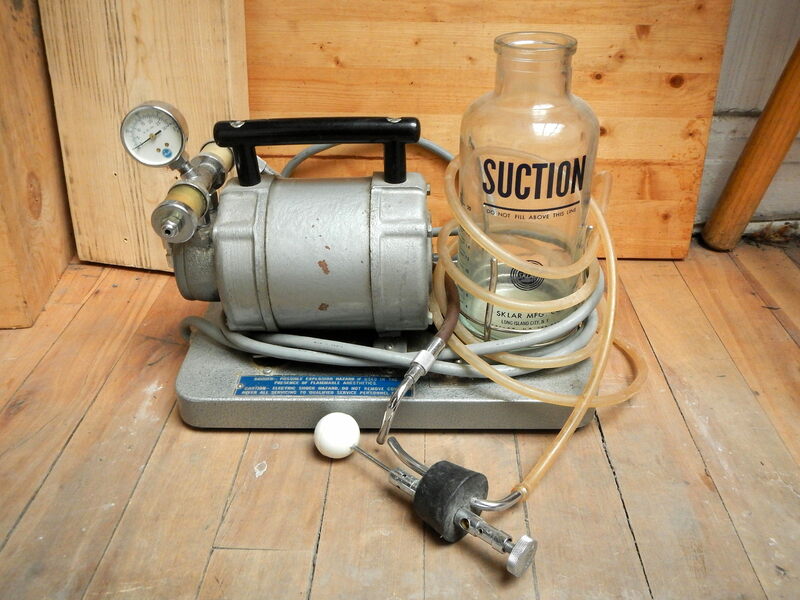 The glass bit is the “Suction Unit.” Apparently it has something to do with surgery and anaesthesia, though I personally have no clue how it works. I was afraid to test it out but it does turn on and make noise. There’s a couple on Ebay that were up for 55$ but neither sold. If anyone has any insights or information about this thing let us know in the comments! The mattresses (and everything else) in this spot looked as if they had been in that garage for the last 20 years. 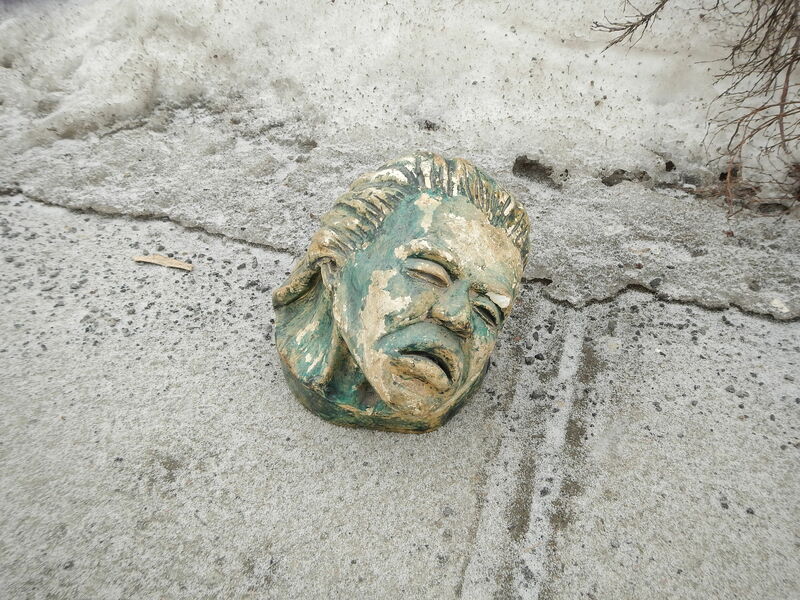 I found this bust and left it on the side of the road near my place. Maybe someone will give it a home. 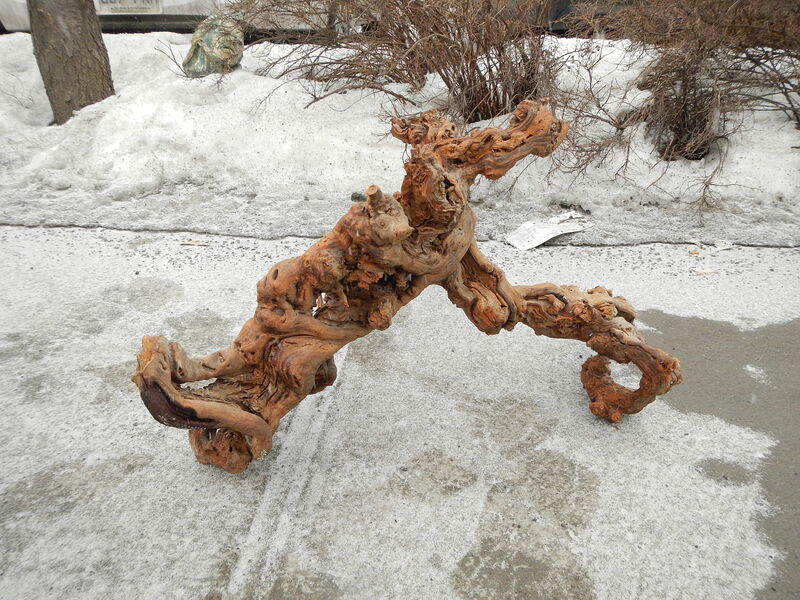 Someone added a hanger to this piece of driftwood so that it could be hung from the ceiling. It needs a good dusting but it’s pretty cool, I might keep it myself. In another bag was an old liquor collection all wrapped up in paper. They’re all partly full, though nothing is more than half. Based on the labels and price tags I’d say most of these were bought in the 60s, 70s and 80s. The Johnny Walker might be a little newer because it has has a serial code. The Crown Royal on the other hand has an excise sticker with 1960 marked on it. 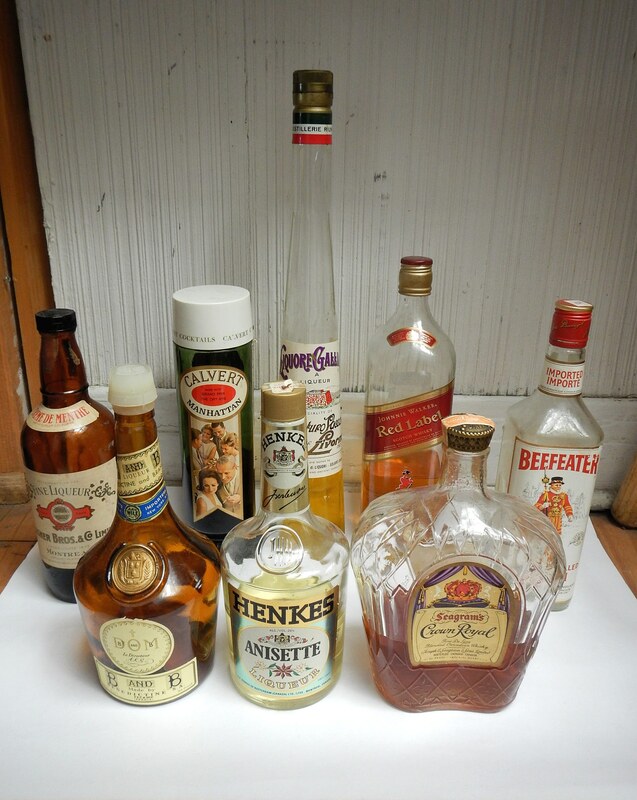 High proof liquor, unlike wine or beer lasts a really long time. They definitely smell pretty normal and I’m sure my room-mates and I will give them the old college try in the near future. I figured I’d ask though: would you try some? This is the place I found the stamp collection, magazines and pamphlets last week. The bed frame looked really nice but I had no room for it. 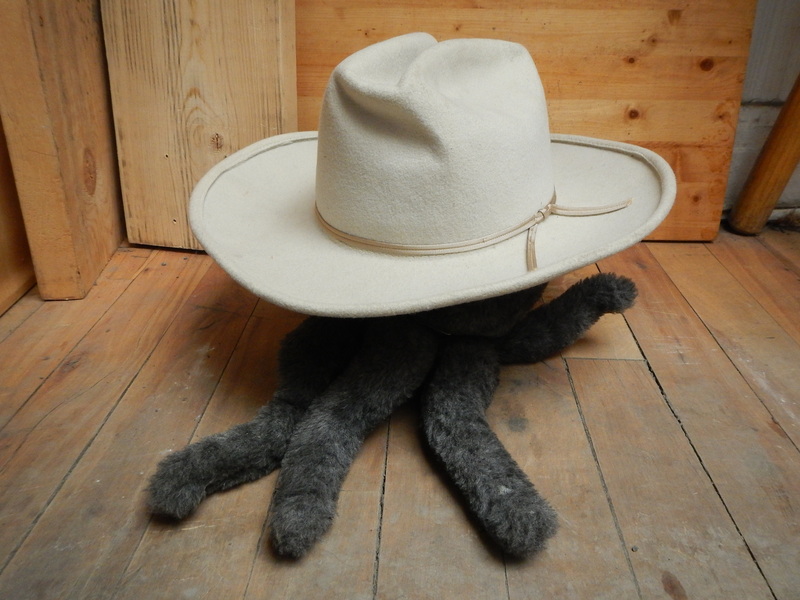 There wasn’t much of interest this time around, though I did find a cool cowboy hat from a Wormser in San Antonio Texas. It’s made of 100% virgin wool. The size is 7 1/4 which I think is a little too small for me. I modelled it on the squid stuffed animal I found in Edmonton, it doesn’t fit it either! I stopped here because I spied the top of a lamp poking through a bag (which you can see in the back right). I took the lamp, giving only a brief cursory glance to make sure it was worth taking. I then started looking through another one of the bags, quickly finding some more nice stuff before I was approach by a man and a woman. 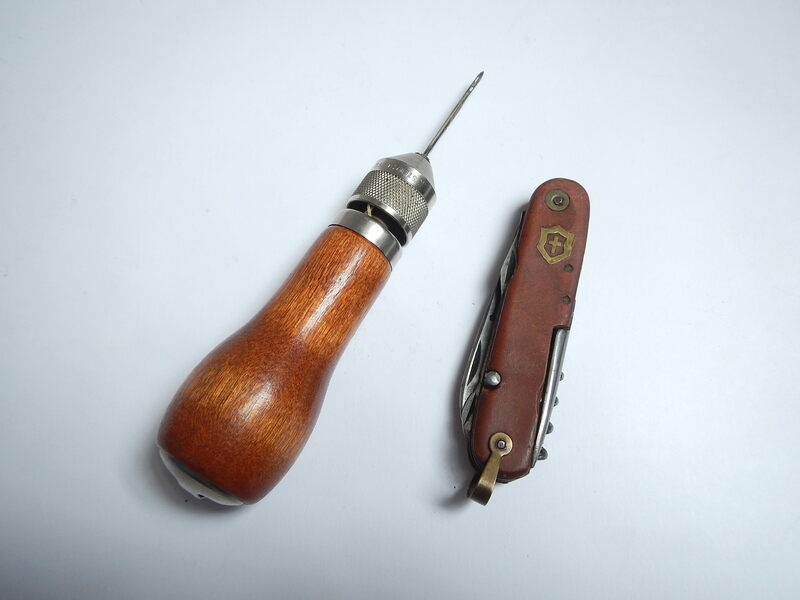 The man told me the items belonged to his father who had recently passed away. It was kind of confusing how it all went down but I gathered that he didn’t want me there and I left, though he seemed fine with me taking what I had already set aside. I knew what I found was great, though, and felt compelled to try again to see if I could at least talk to him more about it. I wanted to save the potential treasures from being destroyed for philosophical reasons but was also motivated by my own financial gain. I sat in the car and thought about it for a while before going back. I couldn’t even open another bag before he came out again and asked me what I was doing. I told him I was looking for valuables. I mentioned the lamp as an example thinking it wouldn’t bring up any possible negative emotions. He told me the lamp was the only valuable thing and that the rest were papers he didn’t want me looking through. He was a bit more tense for this conversation but he was still very well composed. I’m not sure I believe that there weren’t any other valuables inside those bags, in fact I still wonder as to what might have been inside, but this time I had no choice but to leave for good. I can’t be too aggressive in one of my more productive neighbourhoods. 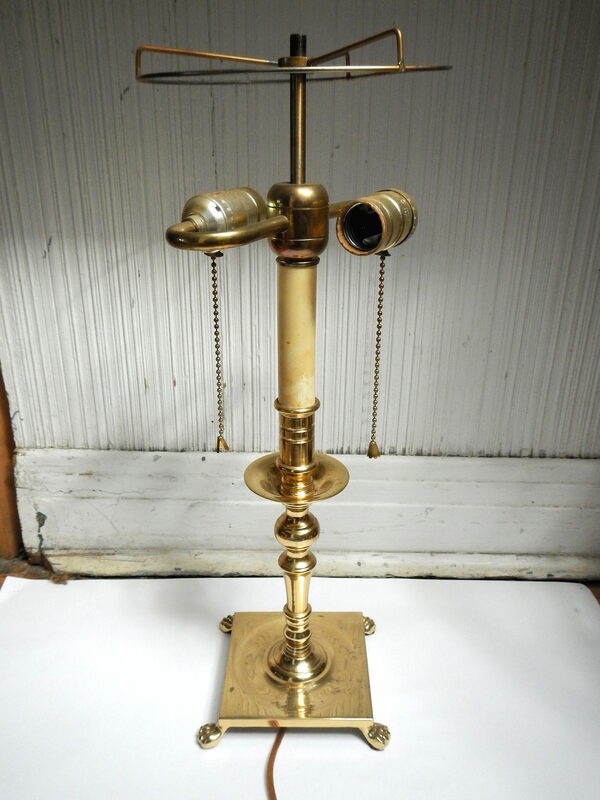 This is the lamp. It’s actually really nice, I just need to find it a matching lampshade. 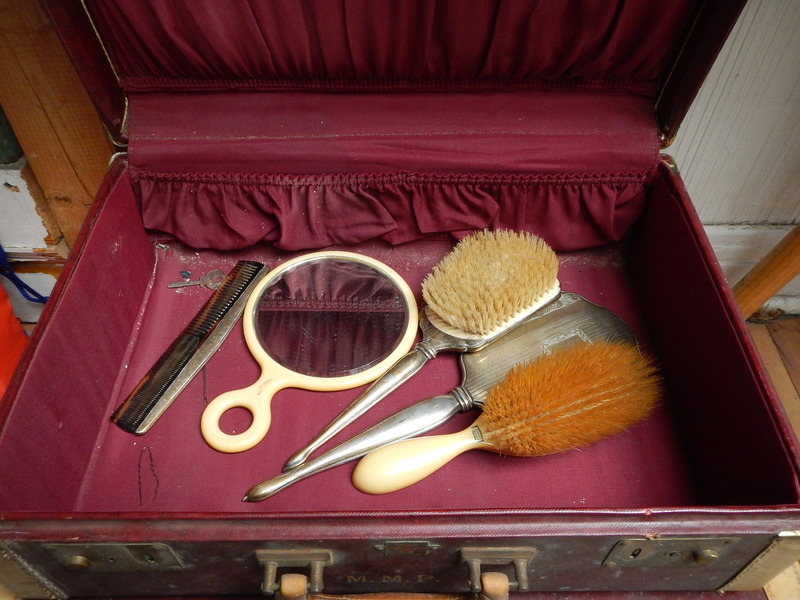 These items were in a little chequebook box. 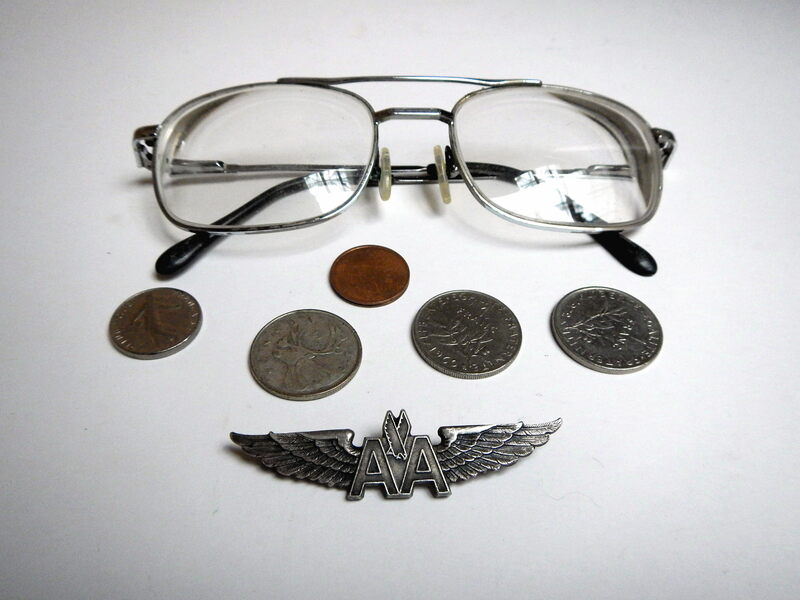 The glasses frames are made of gunmetal and the 1968 quarter is partly silver. 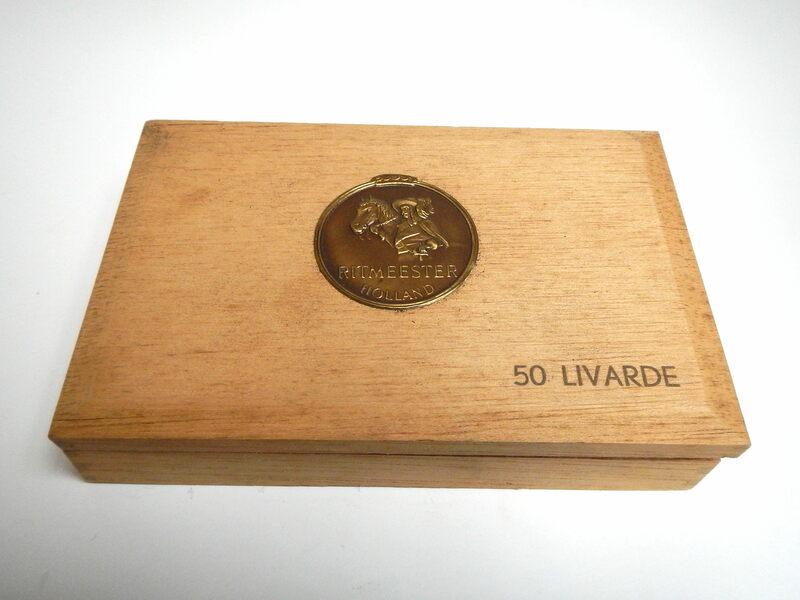 That was the last year any silver quarters were produced. 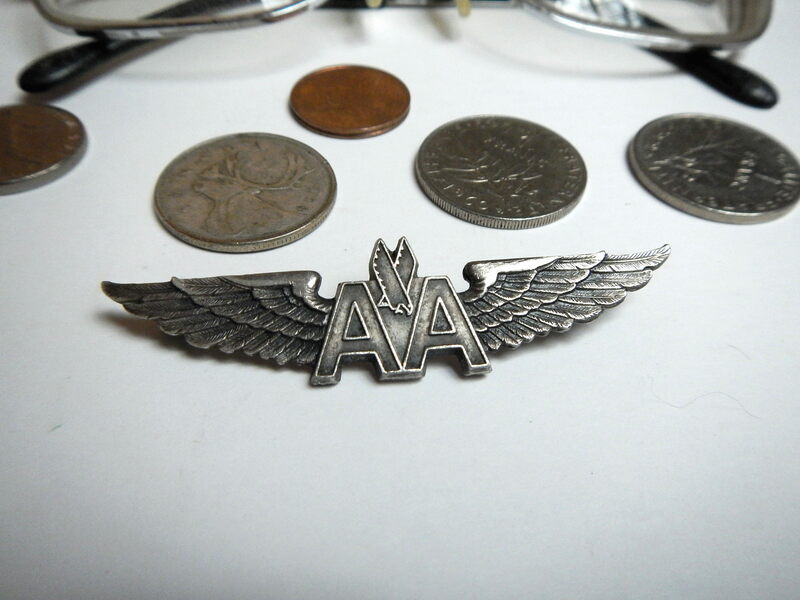 My favourite piece are these old silver filled American Airlines “wings”. They’re very beautiful and probably would have been issued to an attendant or other employees. On Ebay there’s a set selling for 111$. I think that price might be a bit of a reach but I expect I could get 80-90$ for them. There was also a little bonus waiting for me at the bottom of the bag the lamp was in. 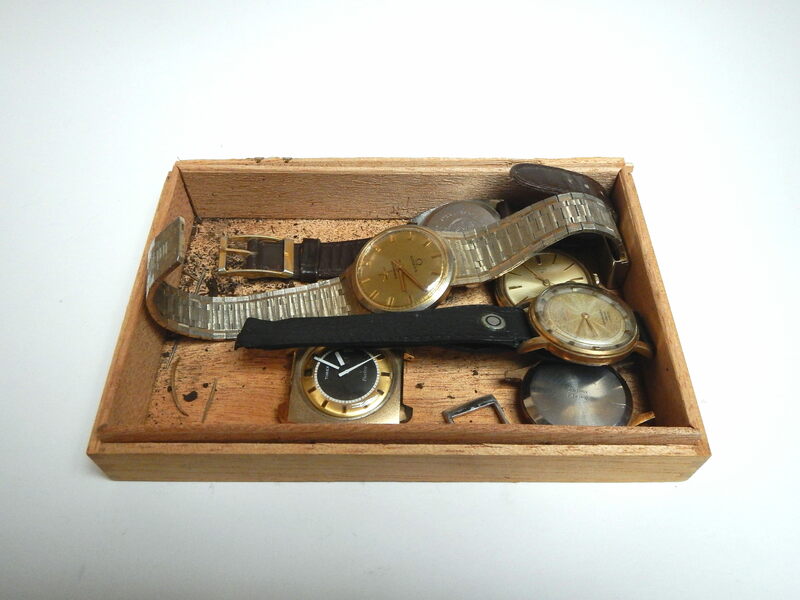 Inside an old, busted cigar box was a collection of watches. The dirt was from some geraniums that were also inside the bag (which I am now trying to save). 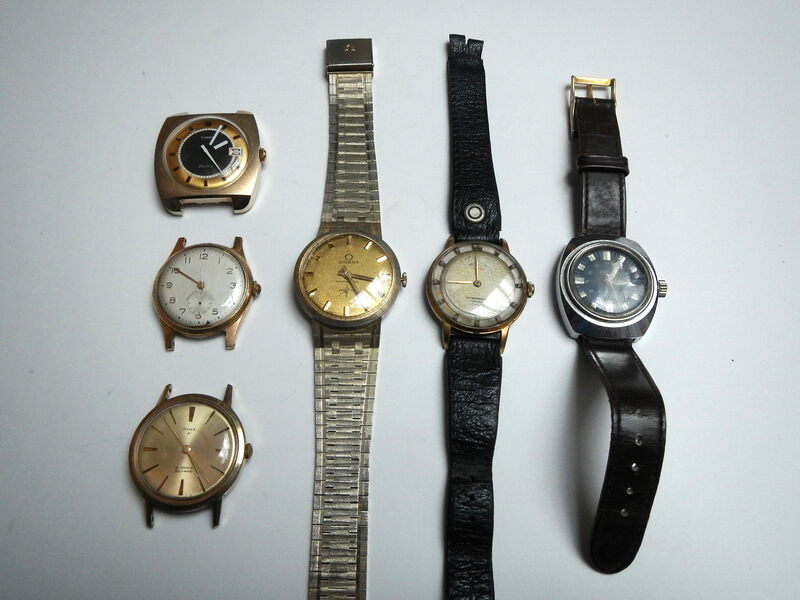 The watches are all fairly old and all have issues. None of the three on the left are working, though they’re probably still worth a bit of money for their parts. The one on the right (a 17 Jewel, Super Datomatic, Waterproof “Mortima”) seems to work fine but has a very scratched crystal. If I get the crystal cleaned up I should be able to sell it on Ebay for 80-100$. The other two tick but get stuck sometimes, they probably just need an expert cleaning. The Omega is almost certainly a fake, it’s marked 18k gold but I think it was just gold plated. Still, it looks nice. I might sell the non-working ones as a lot on Ebay, though I wonder if I should hit up some local shops to see if anyone will buy them locally. Due to terrible weather I decided it was best just to take the morning off, write this post and get some of my garbage on Ebay. I hope to get out tomorrow morning to see if that section of Rosemont has anything else to offer me. I might be getting a cold though and if it gets worse I might just take the day off. Either way I’ll keep you posted!